Today I thought I'd share with you my picks from the newly arrived beauties that have recently hit Wallis' website. Now I don't know about you but it's that time of year where you can start getting fed up of all your winter woolies & start longing for brighter warmer days. Plus all the gorgeous SS15 additions that are currently hitting the shops aren't helping either are they?!! Having been lucky enough to receive a Wallis voucher for Christmas, being 'sensible' I thought I'd spend it wisely by purchasing some new additions that can not only be worn straight away but will be perfect for Spring too. I mean seriously is there EVER anything nicer than buying new clothes when it doesn't cost you a penny?!! Cue a mug of green tea, a slice of cake & an hour on the internet & I was in fashionista-heaven! Needless to say were lots of items to tempt me & screaming 'buy me' as I scrolled through but here's what made it into my virtual basket before the final cull was made. 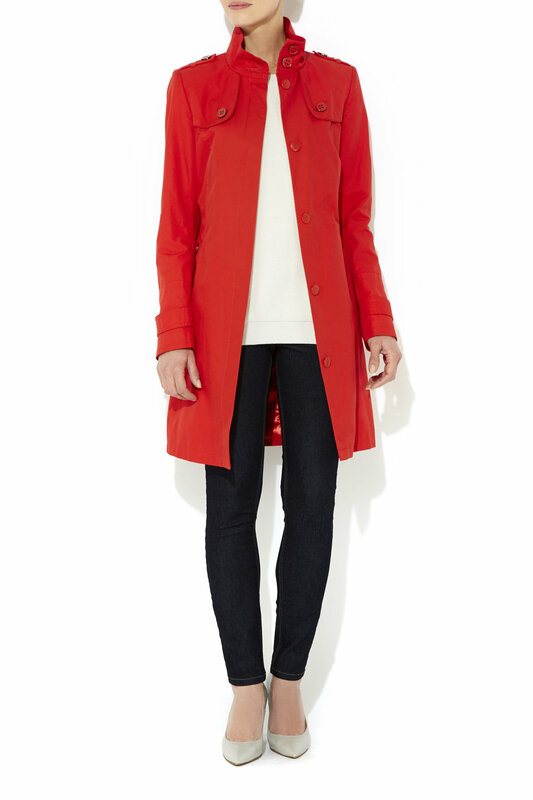 First up I just love this bright red jacket. A great wardrobe classic that would not only prove useful for smarter occasions but which I'd really love to dress down with some laced up pumps, distressed boyfriend jeans & a breton. Next up is this stunning hot pink shift dress. Again a great dress to dress up or down & is available in a variety of colours but I'm just loving it in my favourite colour. I'm thinking this would be perfect teamed with a tan come the warmer months, some metallic sandals, a stack of gold bracelets & my ASOS pom pom bag from last summer. 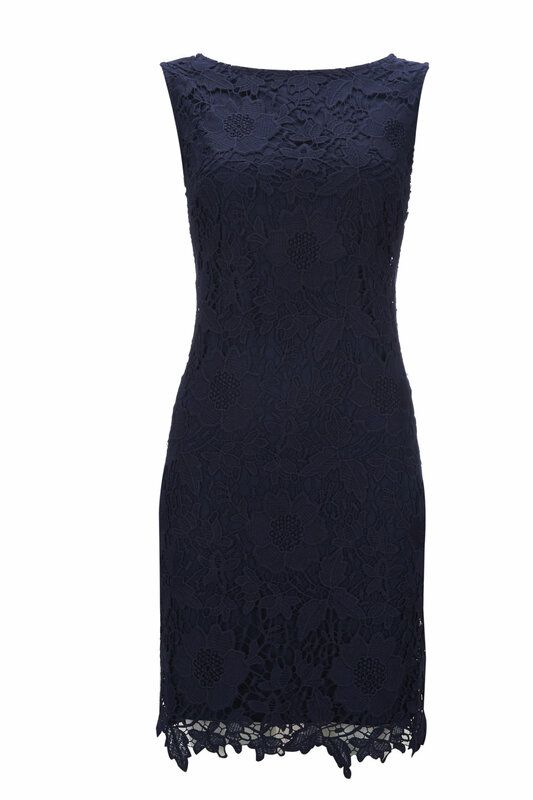 Sticking with dresses, I'm also loving this lace shift dress too. A wardrobe classic that would be perfect for any special or summer weddings but I'm also thinking it would be ideal for our summer holidays. Team with gold accessories with maybe a dash of hot pink thrown in & I'd be good to go....now if it could just speed up time to when we go away!! Back to the cooler months with this colour block jumper. I'm loving the pop of colour mixed with the various shades of grey. I mean how fab would this look teamed with some pleather leggings & heels?! This red funnel belted mac also caught my eye. I found the red Zara cross body bag that I brought last year so useful that I think a red mac would be a great addition to my wardrobe & it would certainly help brighten the dullest of days. Now as much as I love all the above items it was the next two beauties that I finally clicked the button on. As soon as I saw this knitted breton I just knew this was going to make the final cut. 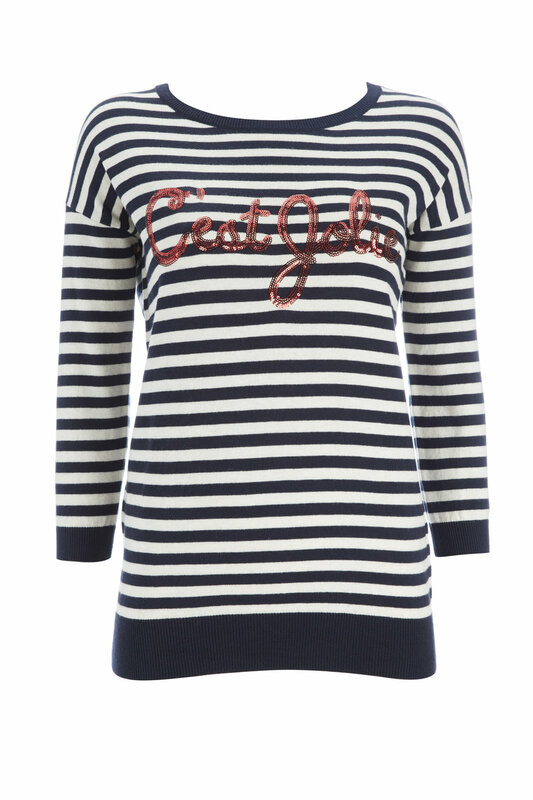 Stripes are always going to be a winner in my book but add in the red sequin slogan & it was a fait accompli. I've got lots of outfits planned for this baby - boyfriend jeans, red cross body bag & my new white trainers, white jeans & my navy ankle boots, skinny jeans & worn under a red blazer & even dressed up with a pleather pencil skirt, the list is endless. 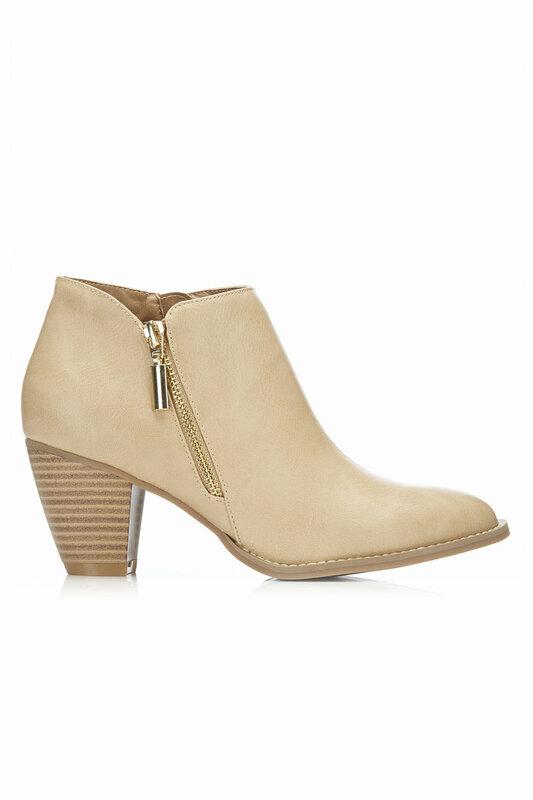 And the final item was this pair of stunning ankle boots. I just love the colour - perfect for spring & cooler days in the summer & due to their colour they're not going to look too heavy to team with bare legs & a dress. First up I think I'm going to try them with my denim dress. So what do you think, do you see anything to tempt you & do you think I made the right choice?! If you haven't taken a look at Wallis recently I'd certainly recommend you take a peek as they have some great pieces currently available & more to come too. I've yet to sort through my pictures from last week's trip to London & my preview of their SS15 collection but I'll be sharing these in the next few weeks but be warned there's some seriously stunning pieces so keep your credit cards handy!! Hi Jane, Well the Breton top and the ankle boots would make it to the checkout, they are lovely. Glad you like them Sue, I can't wait to start wearing them! Great post. 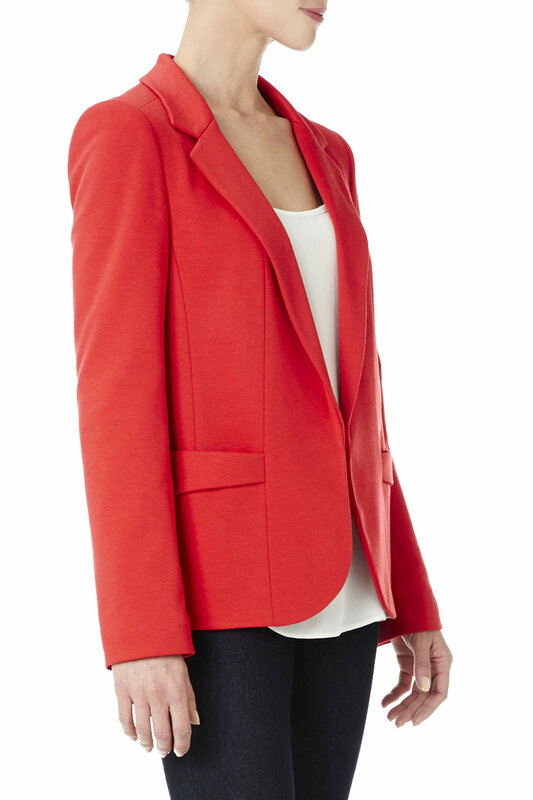 I love the drape of the Wallis jacket and will have to check out the company as I've not heard of it before. Love the boots for all the reasons you mentioned. But with a foot of snow here in Cleveland, Ohio, I'm inclined to reach for your sweater/jumper! Hi Lorraine wow I can't believe you've got a foot of snow - we were due some but it turned to rain so my son is gutted he had to go to school. Fingers crossed your snow comes our way soon! It's fab isn't it Michelle & like you say so much cheaper than the Whistles equivalent. There's too much temptation isn't there Sarah. Thanks Lynne, they've got some lovely picks in at the moment that are great for updating winter outfits to Spring, just wish this cold weather would disappear now! Your outfit is so cute. And I really love that lace dress. It's so pretty. Thanks Heidi, the dress is gorgeous isn't it? !